Cherry Lakes is a 5 acre gravel pit and the biggest lake on the complex. 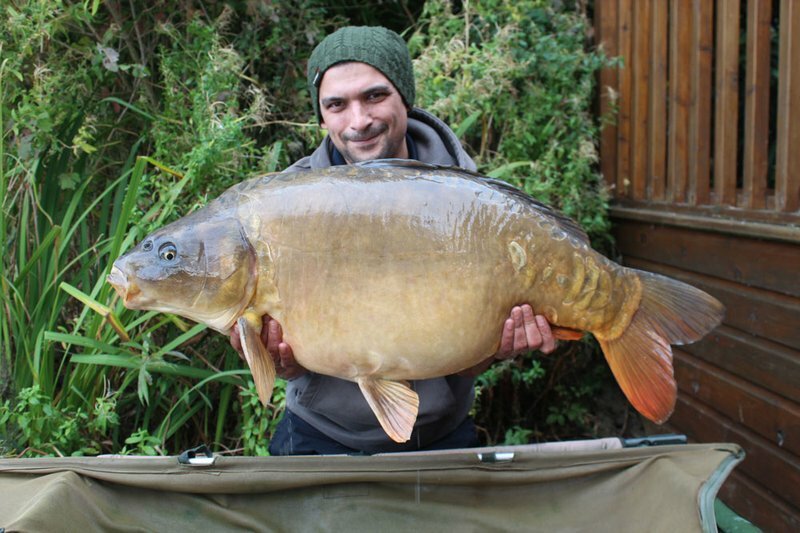 It holds over 300 specimen Carp, most of which are over 20lb and up to 44lb. Cherry Lake contains around 300 Mirror, Common, Leather and Ghost (Mirror and Common) Carp of a variety of strains. The vast majority of these Carp are over 15lb with well over 200 Carp being 20lb+. 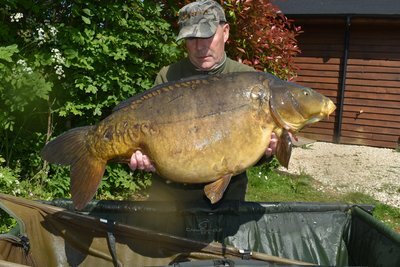 The lake contains over 30 different 30lb+ Carp with 3 over 40lb+. 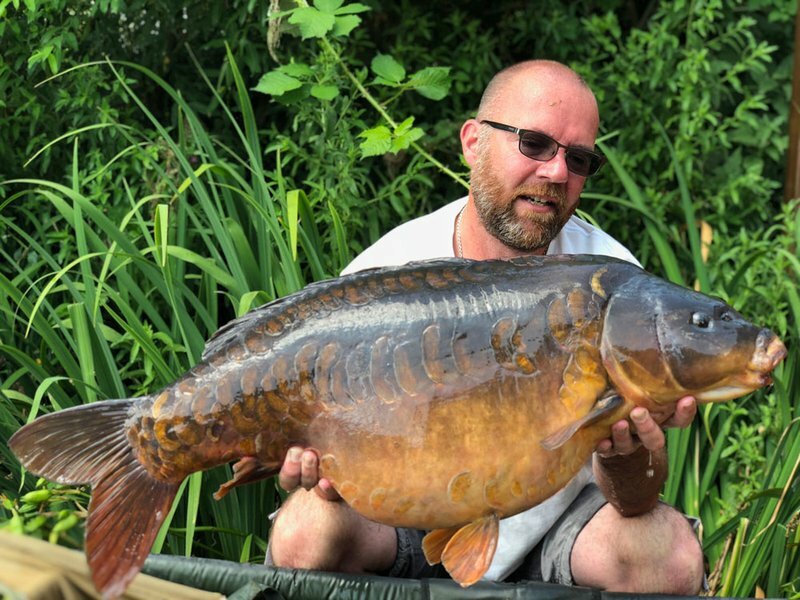 The lake record is currently held by a 44lb Mirror Carp which was caught in October 2018. During 2018 we had 27 different Mirror and Common Carp caught and photographed properly over 30lb. This includes six Ghost Common and Mirror Carp over 30lb, which are magnificent fish. Please scroll through the updates within the Latest News and Photo Gallery sections of this website to see some photos and reports of some great Carp.We have more than 35 Carp over the magic 30lb mark including Mirror, Common and Ghost Mirror. 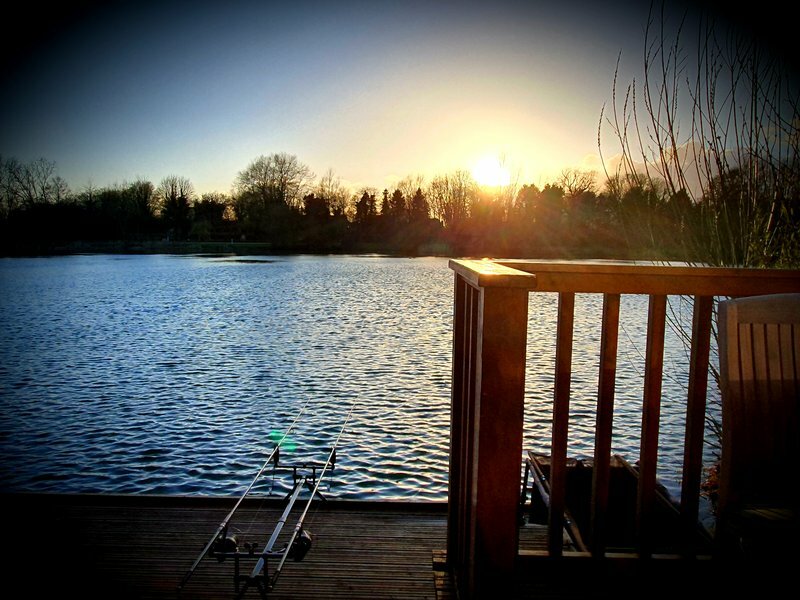 With it's many features, Cherry Lake is the experienced Carp anglers dream and a delight to fish. Keep reading to find out more. Cherry Lake was drained and restored by us in 2012 and significantly improved. It has been designed by Carp anglers for Carp anglers and is the thinking Carp anglers dream. Cherry Lake represents a good challenge for the experienced Carp angler and cannot be described as easy or prolific. Even good anglers can blank on Cherry Lake. Cherry Lake is not a runs water and is generally not suitable for the inexperienced or novice Carp angler. If in doubt you will probably enjoy your stay on one of the smaller more heavily stocked exclusive lakes. 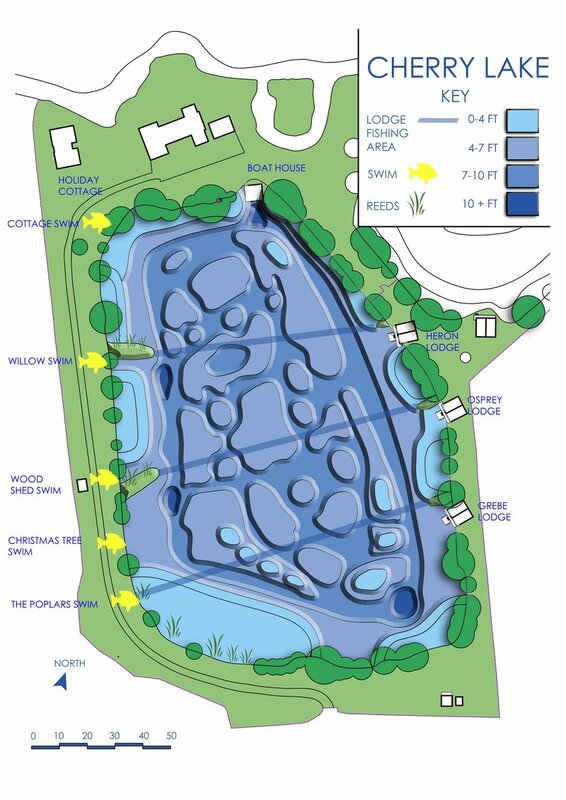 All the Lodge and Cottage swims contain plenty of features ranging from tree lined bank side ledges and shallows, to deep channels and holes, to plateaus and bars. Click here to find out about the lake restoration project. Since the beginning of 2014 over 115 different anglers have landed 30lb+ Carp and joined the Cherry Lakes 30+ club. These ‘membership’ complimentary polo shirts (and hoodies for the over 35lb)+ have become much sought after and prized possessions! Typically 2-4 runs per session during the spring to autumn period is a realistic expectation for a competent angler. Often the difference between a memorable trip and just a good break is the ability of the angler to convert their chances. We recommend that Carp rods with a test curve of at least 3lb are used particularly when using a bait boat to fish at distances of 75 yards plus. Too many fish are lost on rods which are not ‘man enough’ for the job. We feel that having a target stock level of around 300 large Carp should be about the right level in Cherry Lake and we will manage the stock levels to this range over the coming years. With this number of Carp the fish have sufficient space and food to stay healthy and keep growing, as well as having sufficient Carp in the lake to ensure it is does not become too difficult to fish. 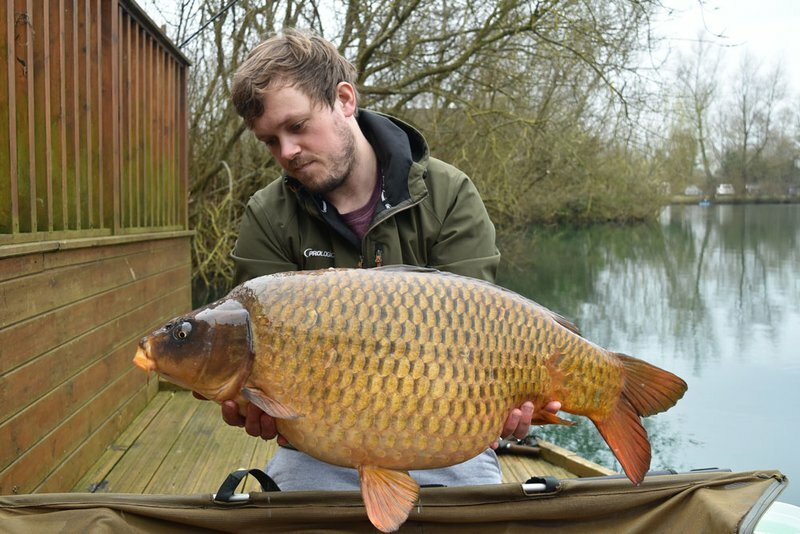 The Carp fishing experience at Cherry Lakes, and in particular on Cherry Lake is all about quality rather than quantity. Each swim on Cherry Lake has an abundance of different features which you can clearly see on the illustration of Cherry Lake below. Each Lodge and the Cottage has at least one acre of water available exclusively for it’s anglers to fish in. As a result the fishing pressure is relatively low for a holiday venue. The only position you can fish from is your Lodge/Cottage. We do not allow bank fishing or sell day tickets. The only people allowed to fish are our Lodge and Cottage guests. The Cottage and the three Lodges, which are known as Heron, Osprey and Grebe, all offer a differing range of features. In fact the challenge for the angler will be to decide where to concentrate on. Within each Lodge and the Cottage there is an ‘anglers pack’, which along with the fishery rules has a series of photographs of the lake bottom and it’s features and a map of each swim. These photos and maps should helpfully give you some ideas as to where to fish. Pleasant to look at, each Lodge is not over-looked and feel very private. Each Lodge can accommodate up to two anglers fishing up to two rods each. A maximum of 4 Rods can be used when two anglers are sharing a Cherry Lake Lodge or Cottage swim. This rule increases the chances of two anglers getting a run as well as reduce the chance of fish loss or damage by being caught in the other lines. A single angler can continue to use up to 3 Rods. There is plenty of room on the fishing platform, but you will need your rod-pods. These rod pods must be free-standing and not the screw in type. Bank sticks located to the side of the fishing platforms ares not allowed. Similar to most other sensibly stocked waters across the Cotswold Water Park, weed wants to grow in Cherry Lake. We work hard to try to maintain the balance between having a sensible amount of weed (which is good for the Carp and the overall water quality) and stopping it from getting out of control. We believe we have got the balance about right and that the weed does not normally cause a problem for most anglers. ’Onion Weed’ is one of the varieties that grows in the Lake but which does not normally cause a problem when presenting your rigs. Some weed will become attached to your rig on the retrieve and it is nothing to worry about. There are several weed beds which are good holding areas for the Carp and are good features to fish to and in. This weed is rich in natural life and the Carp constantly feed in it. Providing your rods are able to control the Carp and you are able to ‘drop’ your leads quickly in the fight, this weed should not cause too many problems. If you hate weed, then you should fish one of the other three lakes (Cherry Pool, Cherry Springs and Cherry Mere) which are all weed free due to their higher stocking density. The bottom is largely gravel and sand as you would expect of an old gravel pit. There are also areas of silt (shallows and in the channels where the silt naturally collects). If you intend fishing the far bank then rods with a test curve of around 3lb+ along with big pit style reels to gather up line quickly are definitely recommended. All Lodges and the Cottage are provided with Carp Cradles, a 42″ Landing Net and a Weigh Sling, so no need to fill up the car with these, and avoid the wet fishy smells on the way back from your holiday! All Carp caught must be photographed over the Carp Cradle and returned to the water in the weigh sling. Both Mike the owner, and Dave the fishery manager, have over 60 years of Carp fishing experience and will be around around to offer any help and advice as required. Please don’t hesitate to ask them as talking about the Carp will make their day! Cherry Lake also contains a large number of Perch which are rarely fished for let alone caught. Perch up to 4lb+ have been found. 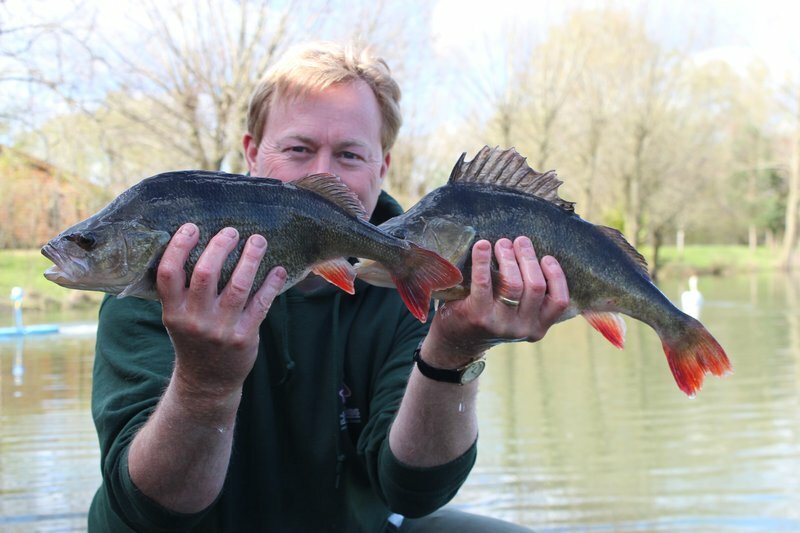 owner Mike recently caught Perch of 2-10 and 2-06 in a few hours in April. There are also some cracking Perch in Cherry Lake. We have done everything we can to ensure Cherry Lake is both very private and secure. We want you to feel safe and enjoy your holiday. There is only one access point to Cherry Lake which is through the main 6 foot high electric gates. These gates benefit from security lighting and CCTV. The rest of the property is fully fenced, mostly with 6 foot high fencing which is topped off by barbed wire. There are numerous security lights around the property including on each of the Lodges. Given all we have done above we believe Cherry Lakes should be amongst the safest lakes to fish.